"Living with Monuments: landscape inhabitation and monument creation in the Avebury landscape"
The lecture given by Dr. Joshua Pollard was on the topic of how landscapes and monuments interacted and functioned within human settlements and the role they played in human society from the Mesolithic to the Early Bronze Age in the Avebury landscape. 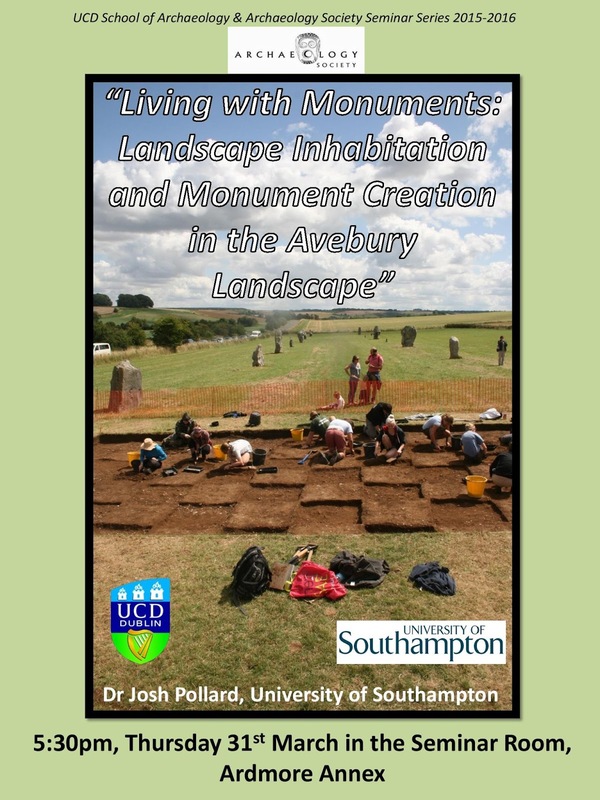 The main area of interest in this lecture is the justly famous Avebury landscape which is famed for its plentiful and well-preserved monuments that range from the Mesolithic to the Early Bronze Age. Located in central southern England, Avebury has long been held as a sacred Neolithic site which periodically saw an influx of prehistoric migration to the area. Around the 3rd millennium BC the Neolithic inhabitants of Avebury put a massive amount of resources and labour into the time intensive construction of stone monuments. A site such as Avebury has rightly inspired heavy academic interest among archaeologists and other professions. During its early Neolithic phase, Avebury boasted stone tombs, long mounds and enclosures. All of these structures were built around 4th millennium BC and are considered to be sacred Neolithic monuments. In a few cases not all of these structures had a distinct and unquestionable funerary purpose in the Neolithic era. In the Later Neolithic period, around the 3rd millennium BC, large stone monuments were constructed on the Avebury valley floor which runs alongside the river Kenneth. These stone features were excavated in detail by Alistair Whittle in the 1990s. Huge numbers were required to build these monuments – labour, resources and land clearance – and it has been shown that the local environment itself could not hope to support such colossal projects on its own terms. Outside resources and individuals were needed to erect these monuments. Was Avebury a ritual site? How did the process of living in the landscape relate to its monumentalism? Avebury seems to portray the quintessential paradox of the Neolithic era in a manner par excellence. The solid, enduring structures of the Neolithic era are stone monuments to the dead while the houses and settlements are ephemeral and elusive; the architecture of the living is the hardest to trace and locate within Avebury. This eloquently illustrates the depth and devotion the people of the Neolithic harboured towards their dead ancestors and spirits. The ancestors required permanent and lasting stone tombs while those Neolithic people living in the present had to make do with perishable and short-lasting structures. The settlement and routine of Avebury has been analysed through surface scatter remains by numerous archaeologists. Dennis & Whittle, in 1993, excavated the southern slopes of Windmill Hill while searching for such archaeological debris. By uncovering the scatter remains of Avebury, it has been hoped that this will invest the site with new interpretations of its history and the ritual meaning behind its monumentalism. Significant landscape modification has been uncovered in Avebury with large stones being ritualistically moved to different locations, utilised as landscape markers or sanctified as key elements of landscape veneration. In Neolithic times, Avebury was subject to consistent and reoccurring migrations or habitations of human activity. Through the archaeological evidence, it has become clear that people periodically and purposefully returned to the same sites in Avebury throughout the centuries and generations. Were these merely sites of expendable and useful natural resources or were these sites of religious or ritual importance to a Neolithic audience? In contrast to the sites of immense natural or religious value, within Avebury itself, there are patches of land devoid of human activity. This begs the question why? Were they simply naturally barren, unproductive to live upon or considered to be cursed or forbidden by the Neolithic inhabitants in some manner? For the Neolithic people, monuments were of profound social and ritual purpose. They housed and protected the ancestors, served as sites of sacred worship and bought communities together in their procurement of resources and the need for labour. Monuments were constantly interacted with in the Neolithic from their construction to their veneration. But what was their overall impact on the scale and location of human settlement? Did they encourage or discourage settlement near their boundaries? The ‘rough leaze’ of Avebury predates the construction of the henge monument. The lithic scatter of the ‘rough leaze’ was created by natural means i.e. tree throws (when a tree and its roots are ripped out of the ground and wrench out natural materials from the soil). As tree throws create natural lithic scatter, these remains had been disregarded by archaeologists as not being man-made. Now it has been made abundantly clear that in the Neolithic such natural occurrences were heavily exploited as readymade forms of lithics and architecture. The West Kenneth Avenue was first excavated by Keller in 1934 during which its first level of occupation was uncovered; indeed the site itself was an undiscovered Neolithic settlement. Keller, while dreadful at publishing reports, excelled at writing detailed archival archaeological accounts of the excavations. Rich lithic assemblages alongside dense concentrations of flint and Neolithic ceramics were exposed within the trenches. The bulk of the Neolithic settlement predates the construction of the Avenue by several centuries and shows the site was first a settlement then an area of ritual importance to the Neolithic area. But was the West Kenneth Avenue a site of routine Neolithic habitation? Perhaps it would provide an opportunity to unearth rare middle Neolithic structures. During the 2013-15 excavations of the site it was discovered that the Neolithic remains consisted of pits and stake holes while in-situ scatter had been forced down through the soil by earthworm action. 20000 pieces of worked flint were uncovered (some densities were 80 per sq metre); dating to the Middle Neolithic 1200-900BC and not all originate from the Avebury area. Chisel arrowheads and discoidal scrapers were among the artefacts recovered. Exotic finds included a macehead fragment and Peterborough ware pottery (Mortlake & Fengate). This area was periodically visited by different groups as artefacts dating from the Mesolithic to the Later Neolithic have been uncovered through scatter and features. In Trench 4, large amounts of chisel arrowheads were uncovered. The primary use of many of these arrowheads was as weapons (albeit not hugely effective ones; experiments suggest that they merely caused non-fatal cuts at distances exceeding 15 metres) and with some arrowheads having a secondary use as knives. These arrowheads were not useful for hunting and may have been utilised as weapons for interpersonal human conflict. Excavated alongside the arrowheads were Neolithic pits – small distinct features which were immediately filled with debris. Neolithic features often, perhaps deliberately cut through Mesolithic pits. These pits were reengaged within the Neolithic period. Clearly the Neolithic inhabitants were long aware of the site being previously used by a former era or people and wished to develop the site with their own needs in mind. In trench 4, an Early Bronze Age feature was uncovered that cut through a threefold pit. This feature was a singular, isolated occurrence within the trench. It was 1.4 m deep and 60-70cm wide. A theory suggests that the pit was dug in order to commemorate a fallen tree of special significance in the Neolithic. Trees in an open field were unusual; perhaps the inhabitants did not want to forget the tree that once stood in the field and wished to ‘resurrect’ it in a manner of speaking. Trench 4 also contains the avenue bank, an artificial mound of turf and top-soil that may have stretched to the West Kenneth Bank. In the end, the relationship between landscape and monuments is a fascinating and engaging topic especially during the prehistoric era. This is a subject that requires more archaeological and topographical research in order to better understand prehistoric society and how they interacted with the landscape the way they did. Landscape and monuments were inextricably entwined in the prehistoric era and further research is required to better comprehend how the two complemented and interacted with each other.